Discussion in 'General Linux' started by Okiepro, Feb 6, 2019. The application still does not do anything. After complete removal with synaptic package manager, the steam launcher is still listed. Is that the spot I should reinstall? 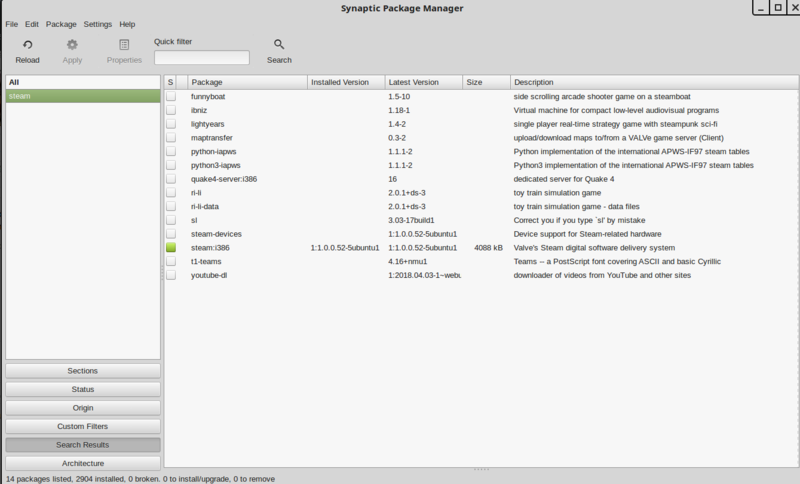 Below is a screenshot of my synaptic screen with steam installed. At this point there is no sign of steam in the menu at all. I suspect the OP may be referring to steam-devices as being a launcher, but bear in mind too that he is operating from 17.2 'Rebecca' and its content may be a little different. First, for your benefit - are you aware that End of Life (ie support) for Rebecca is around mid-April coming? You may wish to consider your options to upgrade. Removal of Steam via Synaptic leaves over 1.4 GB in files generated. Brian is on LM 18.3 ‘Sylvia’ Cinnamon. Once installed, that works, but note that there is a long pause between when Steam has completed getting its updates and when a popup appears saying that certain tasks are being performed and then, and only then, Steam launches. 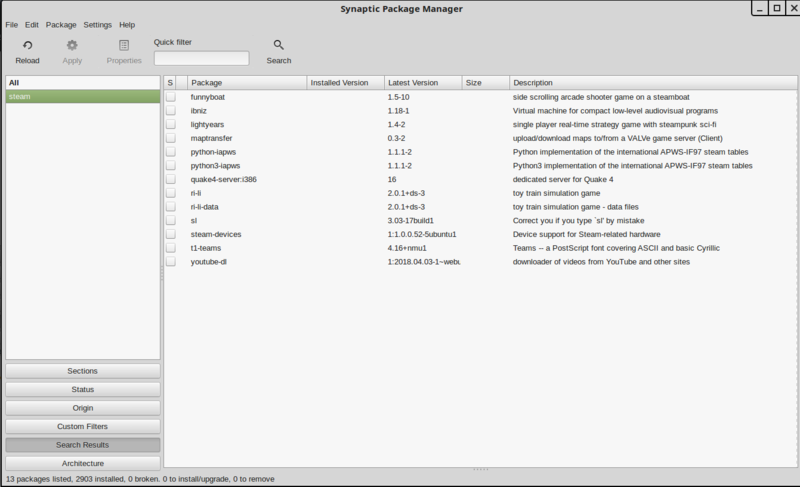 By this time, it has appeared in our Synaptic Package Manager as well. Nor is it a matter of leaving behind a small number of dependencies. /home/user … where user is your username. Then there is a visible folder Steam containing logs. I have not taken the time to generate a code string that will remove all traces, so I have simply, in my own case, proceeded as follows. # gets rid of the Logs (visible) and their folder. There may be some more yet for housekeeping, if so, I will report back. @Okiepro - do you know what games the grandkids play? ie that they are definitely available under Steam? I'm off to do some voodoo and I'll be back when I can. I was aware that the retained files were around 2 gb. I will reinstall Steam....it comes in handy when kids come with visitors and need a diversion...saves them spoiling Belle any more than she already is. My immediate reaction is for Okiepro to update to LM 18.3....could be a quick(ish) fix ?...then again kernel differences may cause drama....maybe better to burn 18.3 to a usb and try it out first ? Surely there is a simpler way. is still the go, but it no longer has the install button down the side, you can do so from the very top of the page. Just a clean bill heads up on the Steam, looks like what I said above covers it. I'll go to their website and see what the story is with their version. So I saved that to Downloads, double-clicked, and GDebi installed it for me. Launches OK. So this is the launcher that the OP (Original Poster, that's you @Okiepro ) is referring to! Note, too, that it is v1.0.0.59, cf 1.0.0.52 available through the Software Manager, so the newer version is likely preferable, ie from the website. At face value, it seems to install to the same points as I listed prior, so removal and housekeeping should be the same? Okie - whether or not you choose to upgrade your Mint, you might want to make the acquaintance of Timeshift - it ships installed with LM 18.3 and onwards, and was backported to 18.2 and 18.1, not sure about 18.0.
and you can ask me any questions over there. It is better than Windows Restore.